Rory McIlroy will be judged by his major wins but some victories are more significant than others and Monday’s comeback triumph in the Deutsche Bank Championship in Boston may well go down as a watershed in the Co Down man’s career. It’s too early to say what the future might hold for McIlroy but two big keys emerged at TPC Boston that could have major effects on golf’s world order. The realisation that he must keep fighting no matter how hopeless the situation might seem — he was four over par after three holes in round one in Boston and still won — is a lesson that McIlroy has struggled to grasp since he was a boy. As he matures, he’s becoming more patient with that aspect of the game but the biggest bonus he will gain from Boston is the cause of that increased patience — a functioning putter. Now that he’s hot on the greens again, he’s the favourite to win his first FedEx Cup win and an even bigger threat to the USA as the big gun in Darren Clarke’s Ryder Cup team. He’s climbed this hill before, experiencing that initial frisson of excitement when he first started seeing results in his putting with Paul Hurrion and then with Dave Stockton. The magic wore off in both case, partly because putting is an art form rather than a science and partly out of boredom with the grind required to groove a silky smooth stroke that repeats under pressure. In the case of Stockton, there were several physical or requirements that were key to the American’s philosophy. They’d split up long before the US PGA Championship at Baltusrol this year where McIlroy reached his lowest ebb with the putter. Step forward Phil Kenyon, the English putting coach from the Harold Swash Putting School of Excellence. McIlroy’s is now the top name on a list of 49 golfers who work with, or have worked with, Keynon over the years. And as the new world No 3 pointed out, the key to his decision to go to the Englishman is that he is able to be himself and mould his putting to the Keynon keys rather than the other way around. 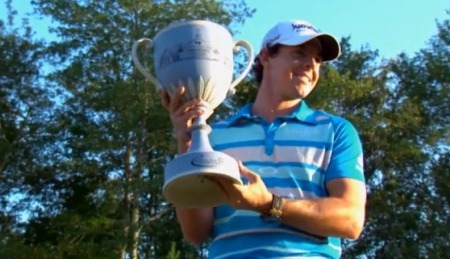 “I could have gone to anyone and I was looking around at different guys,” McIlroy said. “I looked at all the guys that Phil works with and none of them look the same. "They all putt differently, they all have their different mannerism, so I knew that Phil wasn’t going to have me in a certain position I didn’t want to be in or I felt uncomfortable with. McIlroy’s renewed confidence with the putter will be like music to the ears of European Ryder Cup captain Clarke, who needs his top players firing on all cylinders on the greens. But while McIlroy mentioned the Ryder Cup immediately in the aftermath of a victory that makes him the man to beat in the last two FedEx Cup events, he also referred to his fightback as a sign that he is finally learning not to drop his head or let his shoulders slump when things don’t go his way immediately. “It’s been a great lesson for me not to get down on myself, to stay patient,” said McIlroy, who was told the same thing hundreds of times by Stockton. In a sense, his fightback was sparked by a small tweak to his putting grip before Saturday’s second round by gripping more on top of the putter handle than to the side, allowing him to keep the blade square. “My putting has been the Achilles’ heel of my game this year and I tweaked a tiny little tweak on the putting green on Saturday morning and I saw some putts go in and got some confidence from that and just went with the momentum,” he said. “I am just proud of myself that I just able to get that momentum going and keep the same thoughts and not get negative if I hit a bad putt. It all goes back to his mood and the thermostat of his game is his putting, McIlroy admits that the system had a habit of shutting down if he overheated between the ears. Asked for an example of quitting in an event he finished, he said: “I don’t know about quit but I have definitely let my shoulders slump and my head drop and just not been as positive about the situation as I could have been. “So it’s happened to me many times before but you learn with experience and a little bit more maturity that four-round golf tournaments, it’s a long time and there is a lot that can happen. I sort of proved that to myself this week. All is right in McIlroy’s world again, which is bad news for the other 69 players (including Graeme McDowell) who advanced to the penultimate FedEx Cup Playoff event, the BMW Championship at Crooked Stick this week. Rory reveals pet peeve: "The most unfair criticism I receive is for what I do in the gym"